Your shop should feature several different category and sub-category pages to help make your shop easy to navigate. These category pages provide a structure for all the inner pages of your shop. For example, a sports shop can be categorized by Men/Women/Kids or by brands like Adidas/Puma/Nike. 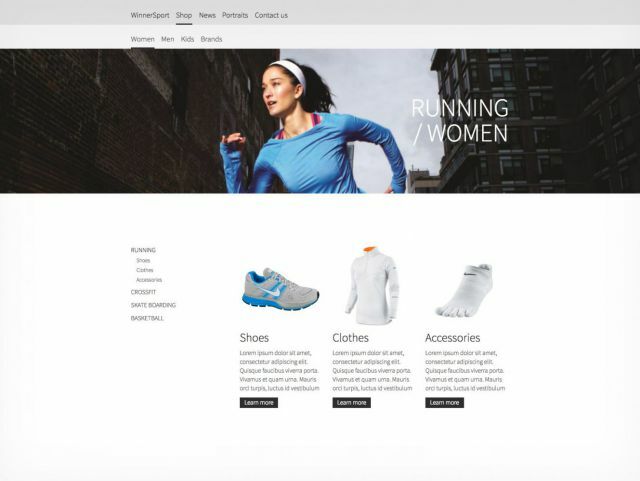 Category pages can also feature product grouping like Shoes/Clothing/Accessories. Choose the categorization that works best for your shop. Below we'll show you some illustrations of the examples listed above. The essential takeaway is that all your category pages should help your customers to get a quick overview of your products that they're looking for while also alluring them to buy additional products that they might not have otherwise planned on buying. Think up-selling! The above category page example is a category page for Women. 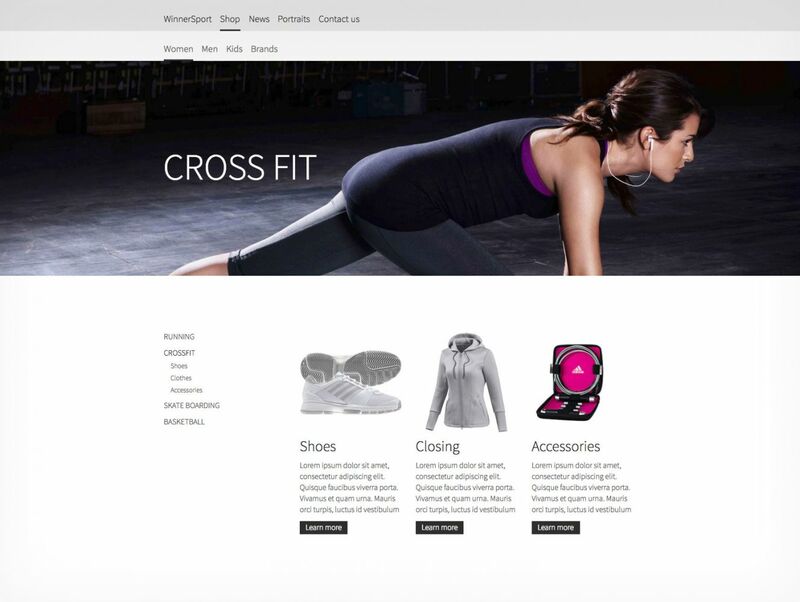 It includes visual links to sub-category pages for products relevant to the different sports, still particular for only women. At the top of the page is a large image (using the Jumbotron module) which features targeted messenging for the target group - active women. Under the top image are links to the four links to the four different sports. You could also choose to include product teasers within the different sports areas as well. There are similar structures for the other categories as well (Men and Kids). In the above image series (click the arrows to browse through the images) you can see examples of the product groups for the particular sport within the head category, Women. Again, you could choose to add product teasears already at this level, perhaps at the bottom of the page.